Kim Nixon, managing director of Wilderness Safaris Botswana, has what you might call a very cool job. Overseeing a number of private camps in different concessions, he’s in the know when it comes to savouring the splendours of the Dark Continent. In Botswana, dark skies are everywhere, easily accessible by diehard campers and lodge-lovers alike. “From an eco-tourism perspective, the premise is based on high-cost, low-impact destinations,” explains Kim. Take the Abu Concession in the Okavango Delta, a 175 000ha stretch of wilderness with just 30 guest beds available per night. Or the Central Kalahari game reserve, where a handful of camps share some 52 800km² of spectacular open nothingness. We’re talking clean, dry air, and skies so inky that at dark moon you’ll battle to see your hand in front of your face. With its low humidity levels and sparse population, Namibia fits the profile perfectly. Much of the country boasts a marked absence of pollution from giant billboards, streetlights and industrial lighting; extraneous, wasted light that blazes unshielded above more developed sprawls. With accreditation by the International Dark-Sky Association (IDA), NamibRand Nature Reserve was proclaimed Africa’s first International Dark Sky Reserve in 2012. It’s a key accolade, and a process that could yield numerous positive spinoffs if achieved in South Africa. In the United States, Florida’s sea turtles are under severe threat as their nesting beaches, once quiet and dark, are bombarded by night lights. Instead of heading towards the moonlit ocean, hatchlings are disoriented by the bright shore-lights, which draw them towards land. Recognising these threats, the IDA has become an advocate for the protection of night skies. It is systematically raising awareness of the negative impact of light pollution – not just on our ecology, but on human life as well. Canada’s Mont-Mégantic reserve in Québec was designated as the world’s first International Dark Sky Reserve in 2007. “It’s interesting that, in the early days of the IDA, the focus was on addressing developed, light-polluted areas and fixing them, rather than keeping dark places dark,” says Dr George Tucker, a retired physics and astronomy professor based in New York. Should accreditation take place, South Africa will be home to one of only three Dark Sky Sanctuaries in the Southern Hemisphere, after New Zealand and Chile. “Our hope would be for a strong involvement with the SANParks system, to protect as many pristine skies as possible,” says George. Andrew Schoeman, a photographic guide at andBeyond Kirkman’s Camp in the Sabi Sand Private Game Reserve, agrees that this presents a fantastic opportunity. “Right now it’s our wildlife that brings people here. Visitors might do Cape Town, with shark diving and wine tasting, and then they want a safari. 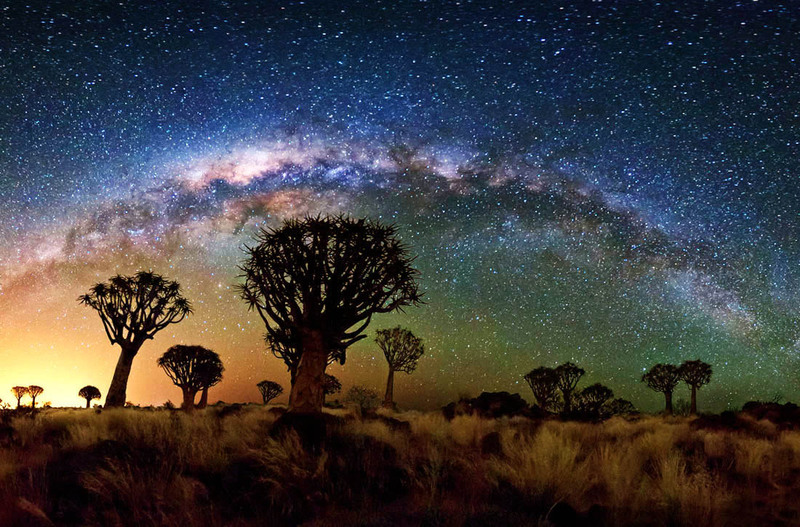 Dark skies are not the reason for their trip, but once they’re here, their reaction to the stars is one of wonder.” Protecting our dark-sky regions would be a vital marketing tool, both for established eco-tourism destinations and more remote ones like the Kgalagadi Transfrontier Park. A plethora of lodges already offers stargazing as a major drawcard. At andBeyond Sossusvlei Desert Lodge in NamibRand, roving astronomer Paul Russell introduces guests to the night skies assisted by a Meade 12-inch LX2000 telescope. He’s also adept at astro photography, something that guests are increasingly keen to try. Bordering the Camdeboo National Park in the Eastern Cape, Samara Private Game Reserve has added a star-bed to its bushveld repertoire. Picture a secluded, raised deck surrounded by 70 000 acres of rugged, mountainous landscape. Then add a four-poster bed, mohair blankets and a mozzie net. Weather permitting, it’s one of the greatest star-fests you’ll ever witness.